Don’t want to unlock your iPhone and launch the Calculator app? Bummed that iPad doesn’t even have a default Calculator? No big deal, because Siri can function as a regular old calculator, and it has the obvious added bonus of being handsfree. 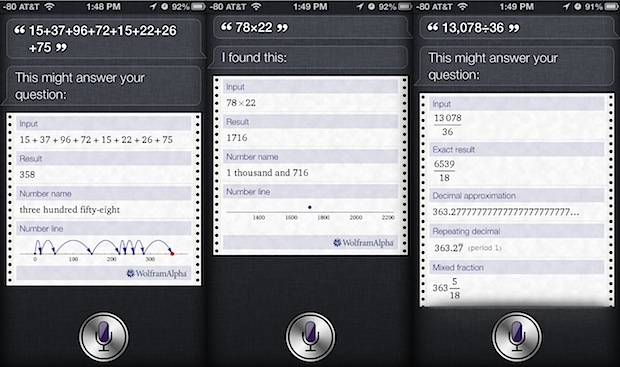 To have Siri calculate equations for you, just feed Siri numbers and thanks to the Wolfram Alpha backend Siri will quickly spit out the answer, complete with a number line. Addition and subtraction, Siri will return an easy to follow number line showing movements to the sum. Multiplication of large numbers, Siri returns the answer in addition to a number line that shows any potential exponents. Division, Siri provides the answer, reduces the fraction, gives the number as a decimal, and even shows a mixed fraction. You can string a variety of numbers together and make fairly complex equations, which Siri typically gets right. You’ll notice on some particularly complicated equations that Siri won’t necessarily obey the proper order of operations, so you may want to avoid using Siri as a calculator for complex algebra and calculus homework. We covered a similarly themed tip recently discussing how Siri can function as a tip calculator, but with how useful the general calculation functions are it’s well worth mentioning the wider potential uses here. This tip comes to us from Jason R. who uses Siri to add up receipts for expense reports, thanks for the idea J! You are right, Cristian. No funciona en español. I recently discovered popcalc which is a very intuitive and easy free calculator for both iphone and ipad. Definitely my default calculator now. I agree with you in that one should avoid using Siri as a calculator for complex algebra and calculus homework. The lack of proper use of order of operations is a bit annoying because it can give you a completely different answer. Imagine if you are doing a sale and you charge your customer the wrong number. In the absence of a regular calculator, I would recommend using the Google Calculator instead. Have you tried using Google Voice for calculations? It turns out that for huge numbers Siri is better than the calculator app. For example, ask her what 1000^1000 is, and she’ll return an answer: 1*10^3000 (which means a number with 3001 digits). But it only gets better. She can handle factorials of “massive” numbers (such as 1000000 which gives a 5.5+ MILLION digit number), but I think the only reason she can handle these ridiculous numbers is because of the fact that she uses Wolfram Alpha. I’ve tried these equations in the online Wolfram Alpha site, and they worked exactly as what Siri did. If i ask SIRI to add more than 100 different numbers (5+6+3+444+72+etc…) she will interrupt before i give the full equation. Is there an app that will allow more than 100 numbers to be added without interrupting at number 76 or 83 to say, “Sorry…”…and then i have to start all over again. Sometimes it works. And for adding 5 numbers as shown above, it works fine. But for a long list of numbers to add, what do you suggest? Is there an app? Because Google voice has the same problem. I think Siri should have an estimation skill because sum people have sum tubel like me. I think this should be a new feature in a new update.